Swedish housing market finally facing its Waterloo? Worries about the Swedish (and Norwegian) housing market have weighed on SEK (and NOK) over the past couple of weeks. The Riksbank’s financial stability assessment published this week shows those fears are justified - the downside risks in Sweden are significant - but also indicates the central bank expects a soft landing in the housing market. If there were to be a major housing crash in Sweden, it would be one of the most well-flagged crises ever. The Riksbank, and various external observers, have been warning about the risks from rapid increases in house prices and escalating household debts for several years. 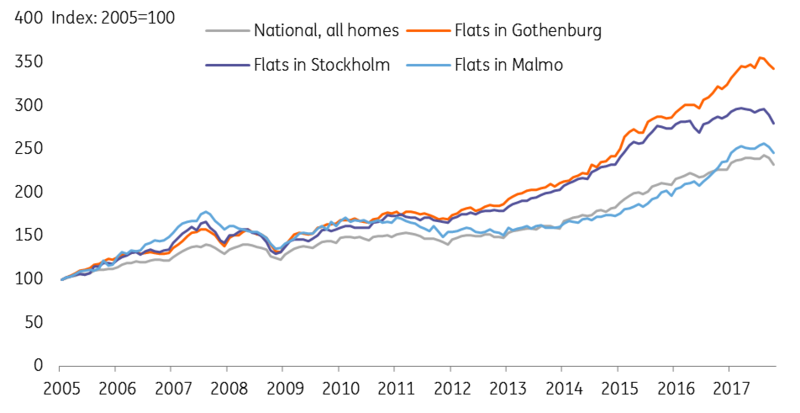 Some aspects of Sweden’s housing market are reminiscent of previous housing bubbles. A combination of strong household income growth, high credit growth, lax lending standards and limited supply has led prices to rise inexorably in recent years. On a national level, prices have roughly doubled since 2008, while household debt has increased to 180% of disposable income - among the highest figures in the world. In major cities like Stockholm the figures are even more dramatic. This has triggered an increase in construction: new housing construction starts has roughly trebled from 2011, and according to the Riksbank there are now 376 companies engaged in developing construction projects in Sweden compared to 111 in 2008. Prices now appear to have reached an inflection point, falling by 4.5% from August to October, as supply seems to have finally caught up with demand. With more new supply coming onto the market over the next couple of years and buyers likely to face constraints from stricter lending standards, further falls can be expected in the near term. That said, housing market dynamics are unpredictable and data gives only limited insight. A lot depends on the plans and perceptions of buyers, sellers, lenders, and builders, which are very hard to observe. The situation might not be as bad the headlines make out. Household income is growing at a decent pace and as an export–driven economy, Sweden will benefit more than most from the cyclical upswing in the global economy. But the situation could also turn out even worse than anyone expects. There are significant vulnerabilities in the construction sector, household balance sheets, and the banking system that could plausibly lead to a self-reinforcing downward cycle that would materially impact the broader economy. The Riksbank’s report and Governor Ingves’ remarks take a fairly relaxed view of the recent price falls. Essentially, they see a cooling down of the market as welcome from a financial stability perspective, and believe that in the current benign macroeconomic environment prices can adjust without causing major spill-overs – in other words, they see a ‘soft-landing’ as the most likely outcome. Asked whether the housing market will affect the Riksbank’s monetary policy, Ingves (like Deputy Governor Af Jochnick on Tuesday) suggested it was too early to say. It will probably take a lot more bad news coming out of the housing market over the next month to materially affect the Riksbank’s decision in December. Looking further ahead though, it seems likely that uncertainty around the housing market will persist into the first half of 2018. Effectively, the question is whether the Riksbank’s soft landing scenario plays out, or the downturn becomes more severe. Until there is more clarity on this, the housing market will become another factor constraining the Riksbank’s ability to raise rates (alongside the need to stay close to the ECB's ultra-loose policy stance). That means the currency is likely to remain under pressure.